Livingston-based company reveals groundbreaking development that could transform the lives of people with missing digits. Scottish scientists have unveiled what they claim are the world's first bionic fingers which they hope will transform the lives of people with missing digits. The invention can help people with up to five missing digits on a hand, whether from birth or because of an injury or medical condition. The device will allow them to do things like point, touch and pick up objects, simple tasks that can be very difficult for those who are missing fingers or thumbs. It is estimated that there are around 52,000 people in the EU who have had partial hand amputations, and 1.2 million people worldwide. The motor-powered ProDigits have been developed by Livingston-based company Touch Bionics, the company which previously invented the i-Limb hand. 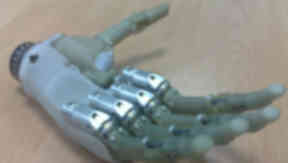 The custom-made ProDigits are fitted to the patient's hand, and are controlled by sensors which register muscle signals from what remains of the finger or the palm. The device detects when it has closed around an object so that it does not crush it. The fingers can be made with a range of coverings, from hi-tech clear and black robotic skins to a more natural looking "livingskin" option. Stuart Mead, chief executive of Touch Bionics, said: "Vocational and social re-engagement is very important to a patient's rehabilitation after a traumatic event. "Partial hand injuries are, by their nature, challenging aesthetically and functionally. "With ProDigits, our goal is to provide all that we can to reinstate a patient's function and interaction with other people in their chosen lifestyle and career." The ProDigits prosthetics are made individually for each patient and cost around £35,000 - £45,000, which includes the cost of fitting, occupational therapy and the skin covering. Most of those using the fingers at the moment are privately funded, but the company said it hoped to look at working with the National Health Service to make them more available.